What is the worst way to parent a strong-willed child? Trying to reason with them, according to Dr. Thomas Phelan, creator of the 1-2-3 Magic parenting guide. When parents are being challenged, they often try to reason, persuade or argue. Too much talking and too much emotion are the two biggest mistakes moms and dads make, particularly with a strong-willed child. 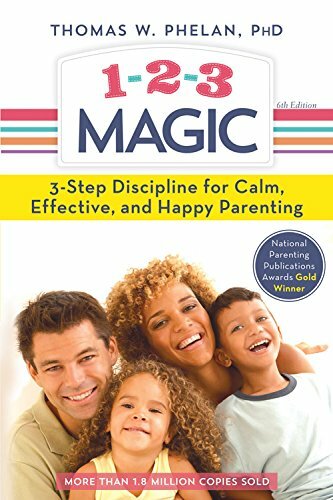 Tantrums – Use the 1-2-3 Magic counting method. Calmly said “That’s 1,” when a tantrum begins, “That’s 2,” if it continues for five more seconds, and “That’s 3, Timeout,” if it goes on for five more seconds. Take your child to timeout, and if they’re over the age of four, the timeout doesn’t start until the tantrum ends. Bedtime – Use the “cut them off at the pass” routine. Sit in a chair by your child’s bedroom door. Every time they get up, put them back to bed. No talking, no emotion. Repeat as necessary. This is a tough one, but parents should see results in a week or so. Dinnertime – Have a supper strategy. Set a kitchen timer for 20 minutes. If your child finishes their dinner in that time, they get dessert. Or, reward them with dessert if they finish three out of four items on their plate. Homework – Do NOT spontaneously ask your child if they have homework. Have a routine and use methods like the “rough checkout” – if the homework is 80 percent correct, neat and thorough, consider it done. You can also use assignment sheets and charting to stay organized. For older kids, stay quiet and allow for natural consequences if they don’t complete their work. Cleaning Up – Grab a garbage bag. Tell your kids to have their stuff picked up by a certain time every day. At the appointed time, put any of their items left out in the garbage bag and don’t allow them access for a day. This method is very effective! I have heard about this method but never really knew how to do it. It is really easy to do and I cannot wait to try it on my own kids and my class. The book does a good job of explaining how to effectively lay out the plan. It is basically a four step plan with you gaining back control of the situation. Parenting is not for the faint of heart. It takes discipline and consistency. Many of us use too many words when talking to children. We explain and want to make sure we didn't hurt their feelings. Well, they are kids, not little adults as the book explains so they cannot be reasoned with. The book is broken into 6 sections with chapters inside the sections. For my daughter I am focusing on Chapter 13 Getting Up and Out In The Morning. I have tried so many things including paying her. Her brother gets an allowance for chores. She still has chores but doesn't get paid. Instead she was told that for every day she gets up the first time I try to wake her she will get $1.00 which would give her $2.00 more than her brother gets a week for allowance. She has made $10 in 2 years. It is ridiculous. For my class I will be focusing on the 1, 2, 3 Magic idea as a whole. Just getting them use to it this week and praying for more calmness in the classroom. This way sounds so much easier than yelling or getting upset. Looking forward to reporting back with some good news.